Chaos In A Bottle » Blog Archive » Couldn’t the wolf read the “no wolves allowed” sign on the sheep pen?? This wormed its way into my brain yesterday, after I dropped child the youngest and her boyfriend off at the movies, and lucky you, you get to read it. Pat yourself on the back for being so fortunate. And I got to pondering – how do they enforce this? Are they wanding people as they walk inside? The answer to the above is – no. They’re not. 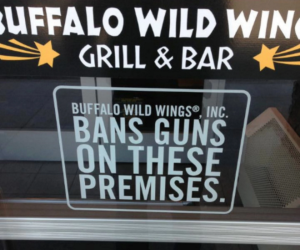 They’re relying on the honesty of their customers to honor management wishes and leave their firearms in the car or at home. How many honest criminals do you know? 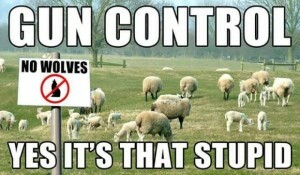 You see, all that sign is doing is disarming LEGALLY CARRYING, LAW-ABIDING citizens. Citizens, like myself, who carry a gun for the protection of innocent life. You’ll never even know I had one, unless you threaten me or mine. I promise. You’ll never even see it. So – here’s my decision, going out to allllll the business owners out there who think a sign is going to stop a criminal. If you disarm me, you’d better be willing to take the same care with my security, and that of my family, that I do. You’d better be willing to not only enforce that sign by MAKING SURE no guns enter the place, but to meet negative force with equal force. Don’t you get it? You have disarmed me. You have willfully, knowingly removed my ability to protect myself and my family. You have left me, and everyone else in that restaurant, unable to defend ourselves. Are YOU going to step up and provide that security? Are your establishments staffed with armed guards? Are you searching every new patron to be sure they’re not bringing a weapon in? If you’re not, and something does happen to my family? I’m suing you for every penny you are worth – because it was YOUR asinine policy that was responsible for turning the building and everyone in it into a soft target. YOU did nothing but think that criminals obey rules. Surprise – they don’t. That’s why they’re criminals. You think your alarm system is going to save you, or someone calling the police? Police are reactionary. They’re not precognizant. They can’t see the future – and it takes TIME to trigger an alarm, or call, the officers to be dispatched, and to arrive on scene. According to American Police Beat, that response time averages 10 minutes. Do you know how much havoc can be wreaked in 10 minutes? How many lives can be lost? Are you really that willing to be a statistic – or to be the cause of someone else being a statistic? Not every business is that idiotic. I recently attended a concert given by the Virginia Symphony. They, too, have a no guns policy; however, here’s where they did it right. Every person who entered was wanded. Every bag was searched. I counted at least three uniformed members of Norfolk’s finest on duty there that night. I’d like to thank the Symphony for recognizing that, if they remove their patrons’ ability to defend themselves, that they must then take over that responsibility, and they obviously took it seriously. I hope you think about this. I hope you think about it very, very carefully indeed. In the meantime? Buffalo Wild Wings won’t be seeing any of my money. I don’t feel safe there. Couldn’t have said it better myself!! The problem is that they seem to think that they’re NOT responsible for their customer’s safety. That sign is nothing more than an invitation to those who chose to do harm to others with the least repercussions inflicted on themselves. I’ve never eaten at one of their restaurants, but will DEFINITELY not now.